Joe Pieracinni (former OVM student from Paisley, Scotland) has family connections in Barga and, together with Lorraine McAvoy, recently started offering holiday courses in a variety of subjects. 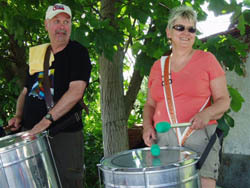 Joe contacted OVM towards the end of 2004 to discuss a holiday percussion workshop collaboration for 2005. Together we planned a programme of 20 hours of study over 5 or 6 days to enable participants to balance their study and leisure time. The course was repeated this year and, due to popular demand, will run again in 2007 over the Spring Bank Holiday half term – an ideal time for families to attend. A total of 10 participants with a range of abilities attended. A couple with their son from Ipswich, 2 couples from Guernsey, Joe himself and his son. The workshop theme was Brazilian & Cuban Carnival rhythms and we began with a Cuban Conga for the first session. This quickly showed how much material we could confidently cover for the final day’s performance. The performance consisted of 4 pieces of music with breaks and solo sections, and we successfully put together a dynamic show that was full of energy. Rhythms: Brazilian Samba, Samba Reggae & Maracatu, alongside the Cuban Conga de Comparsa. Instruments: Surdos, Bombos, Congas, Repiniques, Caixas, Tamborims, Agogo bells, Cow-bells, Timbas & Shakers. Techniques: Intros, breaks & solo phrasing for particular instruments. Musical & rhythmical concepts. “If it’s at all possible, the course this year in Barga was even better than last year’s, with the town eagerly anticipating the final night performance after being knocked out by what they heard in 2005. This time we not only filled the Piazza Angelio but also the Barga Jazz Club! “Once again Raz did a wonderful job of bringing people together to form a tight, cohesive unit that had loads of fun at the same time as learning new techniques and rhythms to take back home at the end of the holiday. His patience and good-humoured approach was hugely appreciated by all of us and the quality of his teaching goes without comment. 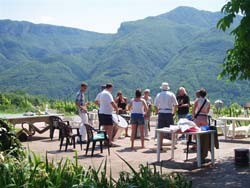 “The family all thoroughly enjoyed the course in Barga – so much so that we have already booked to return next year. As we all enjoy drumming, this was an ideal family holiday for us and would certainly suit any other family involved in Latin percussion. The accommodation was very good, right in the heart of the town. The scenery was spectacular and the local people were very friendly. The rehearsal space looked over the mountains, and there was plenty of shade under the trees and a swimming pool to cool off after drumming sessions.